"Intertwined Skies" by BlissBunny. Used with permission. A winged unicorn is a unicorn with wings. The idea would be to combine all the mobility of a flying creature with grace and rarity of a unicornnote and occasionally magical ability. Also known as an pegacorn, unipeg, or cerapter,note keros (horn) + pteros (wing) but the most familiar term to use for this species is ''Alicorn'', which is a combination of the French words for wing (''aile'') and horn (''corne'').note Note that in French, the word for unicorn is also licorne. However, be careful with this usage because the word alicorn also refers to the horn of a unicorn itself. When winged unicorns appear alongside regular pegasi (pterippi is the general name for winged horses) and unicorns, it often indicates a (benevolent) hierarchy where they're usually top of the pecking order. In fantasy universes featuring humans, winged unicorns often serve as the Cool Horse, and will indicate that their rider is super-special. Generally, they are rare — too many of these critters running around your fantasy world might make a work seem juvenile, since it's a melding of two magical creatures little girls generally adore. It's more likely to be a one-off creature with an unusual background (a "freak" unicorn or pegasus, a mysterious race in itself, or the result of powerful magic). It's surprisingly uncommon for them to be the actual hybrid offspring of a unicorn and a pegasus. A Sub-Trope of both Unicorn and Pegasus, and also Hybrid Monster. However, to most Asian cultures, there is no difference between a winged unicorn and a regular unicorn.note Also, pegasi do not exist in those cultures. Depending on the culture specifics, normal unicorns either don't exist in their folklore and all unicorns have wings, or the unicorns of their culture can magically make their set of wings appear and disappear at will, and are usually portrayed as Sapient Steeds. A Toyota commercial in 2014 featured a huge pink plush winged unicorn. It was so huge that it had to be strapped onto the roof of the car. This is Lady. She's a unicorn... and a pegasus. Unimon of Digimon Adventure, a unicorn Digimon with tattered fabric wings. Pegasus a.k.a. Helios in Sailor Moon is winged, of course, but is also a unicorn as well. The title character of Unico could use his magic to give himself wings in dire situations. He developed little bug wings and a slightly longer horn in sort-of bad situations, and became a full-grown silver unipegasus for those really bad occasions. Like dealing with a giant embodiment of evil. The Janus Unicorn of Toriko is this with some leonine features. It is implied that they are very powerful. In the manga one individual has a extra pair of legs, making it a mix between a pegacorn and Sleipnir of Norse Mythology. At one point in the early 2000s, Hello Kitty was depicted to be in the presence of various winged unicorns. Tokimeki Tonight has a pair in the netherworld pulling a coach. Yu-Gi-Oh! has Crystal Beast Sapphire Pegasus. Amethyst, Princess of Gemworld rides one in both the comics and the DC Nation shorts. In Wonder Woman And The Star Riders (a promotional comic for a toy line and animated show that never came to be) Wonder Woman rides a pink winged unicorn named Nightshine. When Wally in Dilbert joins the "1% club," he gets the key from a tiny flying unicorn. Most of the characters from My Brave Pony: Starfleet Magic. "Unipegs" are mentioned in My Inner Life. Pretty much any My Little Pony: Friendship Is Magic fanfic will naturally include these. Lauren Faust, the original creator of the G4 cartoon, has a ponysona in the form of an alicorn that is informally referred to as the Fausticorn, which fanon and fan works often casts as Luna and Celestia's mother. Ditto for Bonnie Zacherle, the original creator of My Pretty Pony and My Little Pony brands, whose fan-made ponysona Bonniecorn is sometimes portrayed as Fausticorn's mother or at minimum her teacher. Some My Little Pony: Friendship Is Magic fics explore the theme of alicorn ascension, comparing it to the quest for godhood or eternal life. For example, Whispers introduces a means of artificially creating an alicorn through the power of science, via combining the racial abilities of pegasi, earth ponies and unicorns. This contrasts with Twilight Sparkle's more "natural" ascension. Fallout: Equestria has artificially-created Alicorns, although they are not true deific Alicorns like Celestia and Luna, instead being mere imitations. Rites of Ascension, written without much reference to season 3, even considers winged unicorns separate from alicorns. And another 'winged unicorn, not alicorn' example: The Moonstone Cup has Twilight doing this for most of the tournament, using the same spell she used for Rarity in 'Sonic Rainboom'. In From Here to Eternity , Discord's mother looks like one, just with the wings of a dragon. However, she's not a pony, she's just a spirit that resembles one. Harmony Theory makes a distinction between alicorns, which have divine powers and immortality, and mere winged unicorns which have similar power levels to unicorns and pegasi. In The Bridge, several Kaiju get sent to Equestria and transformed into native species. Destroyah strongly resembles an alicorn. According to Word of God, she was turned into a pegasus, but a Partial Transformation meant she kept her horn from her original form. She cannot perform magic with her horn, but can ignite a Laser Blade from it as she already had that ability. The Freeport Venture: In Freeport Venture: Blood and Iron, the lich Rising Fire is a rather nightmarish take on this concept. She started out as a normal unicorn, and gave herself batlike wings of skin and metal, alongside an alicorn's stature, as part of her transformation into a skeletal undead. The alicorn Princess Skyla, a character from the real-life toyline who never appeared in the show, is the final boss in the fangame Twilight Wing, appearing as a non-animated picture of the toy. In Theirs Is The Glory, the emblem of the 1st Airborne Division features Pegasus with a horn. Bearing an Hourglass: One of Norton's quests is to free an alicorn from an evil sorceress. The Alicorn himself gives a different derivation of his name, claiming the early Latin-speaking Romans called him "Cornu"; later, Italians added the definite article to make it "Licorne", "the horn"; the then Arabs added their article, forming "Alicorno", "THE the horn"; and now he is called the Alicorn, adding yet another article to the mix. Then again, everyone Norton meets in the so-called "Contraterrene" world, including the Alicorn, are merely Satan's minions acting out the roles they were assigned, so his etymology is suspect. Dream A Little Dream, cowritten with Julie Brady's, is a Fantasy Kitchen Sink where the two super-powerful "creators" of the magical world are bonded to a winged unicorn (referred to in the novel as a "unisus"), Esprit. The perfect prince, Michael, also has a winged unicorn stallion, Heat. Demons Don't Dream has a winged unicorn, referred to as an alicorn. It's claimed that alicorns are the very rare offspring of a unicorn and a griffin. Avarclon, the guardian beast of Avaric in The Darkangel Trilogy, is described as a gray unicorn with eight wingsa large primary pair at the withers, plus Mercury's Wings of both the talaria (on all four hocks) and head-wing sort. That said, he's never actually referred to as a "unicorn" or any of the terms for the winged variety in the narrative; instead, he's a "starhorse" or the Latinized "equustel." Rare evil (and anthropomorphic) example: The Polluticorn from Mighty Morphin' Power Rangers. A song from the Rhapsody of Fire is titled "The Last Winged Unicorn"
Another song called "The Last Unicorn" is about a unicorn that grows wings in order to survive The Great Flood. While it has not appeared in any songs yet, fans of Taylor Swift tend to like pegacorns since she mentioned one in the behind-the-scenes video for "White Horse." And she dressed up as one for Halloween and spent the entire day doing interviews in costume. Dungeons & Dragons calls them alicorns. Pathfinder: The first Bestiary used a winged unicorn as its main example of half-celestial creature. In Warhammer Fantasy, the carnivorous Black Pegasus invokes a more malevolent take on this trope, as it has a unicorn-like horn (or sometimes more than that), which it uses to gore and impale prey, and bat-like wings. In the Fire Emblem series, Falcoknights ride what appear to be winged unicorns, although the horn could conceivably be part of the pegasis' armor. Although the horse itself is never actually seen, the first Baten Kaitos game has a Magnus card called Pegasus Horn. The Uniceros in Tales of the Abyss. In the parody Flash game Linear RPG, the mysterious Tseret Nievol has a pet pegacorn, supposedly so awesome that Chuck Norris has eight of them. Quite a few varieties of Winged Unicorn are offered as limited-edition or bonus items in Farmville. Some of them ramp up the Glurge with butterfly wings. Princess Sophia befriends one of these in the Awakening series, who then gives her a ride to the Skyward Kingdom. In keeping with the series tendency for bizarre creature designs, Shin Megami Tensei IV's take on the Centaur includes a pair of winged unicorns on its shoulders. The prologue of Metal Gear Solid V: The Phantom Pain ends with a sequence where Big Boss flees from the hospital on horseback, only to have a demonic entity known as the Man On Fire pursue him while riding a flaming pegasus with a unicorn horn. The Angry Video Game Nerd Adventures has one as the boss of Happy Fun Candy Time. Charger Escape by Pastel Games has you transform a regular horse into a unicorn into a winged unicorn. Imagia 3: The Quarry has a winged unicorn missing both its wings and horn, requiring you to solve a set of puzzles in order to give them back to it. In Ace Attorney Investigations 2, there's a statue of a winged unicorn on top of the PIC's roof. It's titled "Contradiction", since being either a unicorn or the mythical Pegasus is mutually exclusive. Since the fan translation of the game was made during a period between 2013 and 2015, with all of the applicants being denizens of the internet, it was almost guaranteed that at least one of them would have been a fan of that show, and someone wasted no time coming up with a reference. The Air Skylander, Whirlwind, is part this and part dragon. Her wings are comparable to Pegasus wings instead of Dragon wings, and her horn can fire off rainbows that damage enemies and heal friends. All this also applies to her Mini counterpart, Breeze. You start off Pony Island playing as a unicorn, which turns into this upon unlocking the Pony Wings. Erfworld ups the ante with Unipegataurs - horned, winged centaurs. From The Annoying Orange and related videos, one can be seen in Daneboe Exposed #9: Daneboe Apocalypse, Nyan Boe, Annoying Orange Presents - Grapefruit's Totally True Tales: Bigfoot and Ultimate Marshmallow Tease. In the My Little Pony franchise, these were almost unheard of until Generation 4, the first generation to feature permanently winged unicorns. In My Little Pony: Escape from Catrina, a Blooper causes pegasus Baby Surprise to have a horn for a couple of shots during the song "Let's Not Take A Nap". The My Little Pony Tales episode "Up, Up and Away" features the four Glow 'n Show Ponies with wings, despite only Starglow being a pegasus in the toy line. Dazzleglow, a unicorn in the toy line, has both wings and a horn here. Four Generation 2 unicorns came with clip-on wings: Copper Glow, Silver Glow, Golden Glow, and Diamond Glow. The series dodged the question of what this type of pony is called (referring to them merely as unicorns in the first couple seasons) until Season 3, which introduces the term "alicorn" in "Magic Duel" and confirming it to be the in-show term for this type of pony in the Season Finale "Magical Mystery Cure" (outside of the show, Hasbro's My Little Pony Facebook page has used the term "pegasus unicorn" in one post, while the German and Swiss Nickelodeon and German Nick Jr. websites have used the German term "fliegendes Einhorn"). The Tie-In Novel Twilight Sparkle and the Crystal Heart Spell establishes that an alicorn is "a special breed of pony", "able to harness the magical powers of the Unicorns, the flight abilities of the Pegasi, and the strength of a good, true heart of an Earth Pony." Trading cards previously listed them as being pegasi and unicorns but not earth ponies, and have since listed them as being all three. Most commonly, alicorns appear as princesses and figures of considerable importance in the setting. Princesses Celestia and Luna appear to be out-and-out Physical Godesses and are the Immortal Rulers of the setting, having lived for over a thousand years and having immense magical power: Princess Celestia raises the sun every day, and Princess Luna raises the moon every night. They also possess unique, ethereal manes other ponies — including other alicorns — lack, signifying their unusual and special natures. In fact, Lauren Faust originally intended them to be the only alicorns in the show. Celestia's niece Princess Cadance is another alicorn. She possesses powerful magic based on The Power of Love, and in the Season 3 premiere becomes ruler of the Crystal Empire. The Tie-In Novel Twilight Sparkle and the Crystal Heart Spell reveals that she gained alicornhood similarly to Twilight — she was a pegasus who ascended after performing a very complex feat of love magic and was adopted as a niece by Celestia. The showrunner later confirmed this as canon. The show protagonist Twilight Sparkle becomes another alicorn princess in "Magical Mystery Cure", with a toyline centered around her coronation. At the time, this was... controversial, to put it mildly, but the furor largely died down by the end of Season 4 and the fandom has more or less gotten used to it. She's specifically identified as the Princess of Friendship. The Season 6 premiere features the birth of the fifth alicorn, Princess Flurry Heart, the daughter of Cadance and Twilight's brother Shining Armor. She's specifically noted to be the first pony in the history of Equestria to be born as an alicorn, instead of ascending at a later date. In "Hearts and Hooves Day", an Alicorn princess is told of and shown in a book. The story doesn't really fit with her being any of the ones established in the show. The Tie-In Novel The Journal of the Two Sisters mentions several other princesses around when Celestia and Luna were young, but none were as powerful, and they have never been mentioned in the show. In "Stranger Than Fan Fiction", one of the trapped doors in the ancient temple (the correct one, incidentally) is decorated with the picture of an alicorn, unlike the others, which have earth ponies, unicorns and pegasi on them. The Big Bad of "Shadow Play", the Pony of Shadows, takes the form of a three-dimensional Living Shadow in the shape of a monstrous alicorn. He doesn't always have wings, which form as extensions of the armor plate on his chest. He was originally a unicorn, becoming what he is as a result of the power he gained during his FaceHeel Turn, explaining why his wings appear as something "added" onto the rest of his form. In "The Mysterious Mare Do Well", the eponymous heroine appears to be one. This turns out to be because she had a Collective Identity which included unicorn Twilight Sparkle and Pegasus Fluttershy, with Mare Do Well's Badass Cape and Nice Hat hiding the fact that she never had wings and a horn at the same time. The unicorn Rarity gains butterfly-like wings in "Sonic Rainboom" via a temporary magic spell, in the toy Glimmer Wings Rarity via an Imagine Spot, and in the licensed merchandise Rarity Fabulous Bag and Flight ◊ of the ◊ Ponies . The spell or a similar one is used in Gameloft's My Little Pony Licensed Game if the player plays a flying minigame as any unicorn (or earth pony or zebra). The changelings are bug monster ponies with horns and insect wings, obviously not looking a lot like any traditional unicorn. After their species-wide HeelFace Turn in "To Where and Back Again", only Thorax and the green-colored ones keep both their horns and insect wings after their transformation: the other kinds lose either their horn, their wings or both. Although, Ocellus, introduced in season 8, has both wings and a horn. In the episode "Do Princesses Dream of Magic Sheep?" Big Macintosh becomes an alicorn in a dream. In one of Adventures in Ponyville 's minigames, Twilight Sparkle uses magic to give the player's pony (as well as an earth pony friend of that pony's) temporary pegasus wings. If the player's pony is a unicorn, she'll be one of these until the minigame is over. A fair few Bloopers have made ordinary ponies into these: three stallions in the Canterlot Royal Guard during a Flashback in "A Canterlot Wedding - Part 1", a unicorn filly in Magic Kindergarten during an Imagine Spot from the episode "Lesson Zero" and a construction worker in "Viva Las Pegasus", among numerous other background characters, have all turned into alicorns in this manner. Rarity also gained wings ◊ in an animation error in "Pinkie Pride". Several other alicorns have appeared exclusively in the franchise's comics and picture books. One of the French magazine stories introduces Canon Foreigner Léon, Princess Celestia's four-year-old alicorn cousin. My Little Pony: Friends Forever: Issue 32 features Queen Parabola, an alicorn zebra who ruled over an ancient pony civilization in the distant past. During the "Reflections" arc in the My Little Pony: Friendship is Magic (IDW) comic book line, The Great And Powerful Trixie is shown to have become an alicorn princess, as well as a paragon of humility. Admittedly, it's a Mirror Universe. A few alicorns — Princess Skyla, Princess Sterling and Princess Gold Lily — have appeared in various toy sets but have not shown up in either the show or the comics. 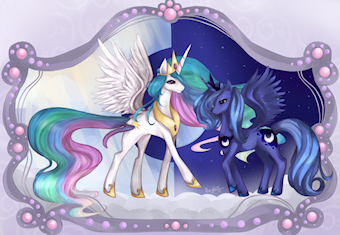 The formerly available Grown Up Ponies ◊ art print depicts the pegasi Rainbow Dash and Fluttershy with unicorn horns. The ◊ formerly ◊ available ◊ Iconic ◊ Print ◊ shirt ◊ features a Creator Cameo of producer Lauren Faust's pony -self . The We're All Doomed men's shirt depicts Pegasus Derpy Hooves with a unicorn horn. In the Virtual Paper Doll Web Games The Fabulous Ponymaker and Rarity's Bridal Boutique, the ponies can be these if they're designed that way by the player ◊. Gameloft's My Little Pony Licensed Game seemingly depicted unicorn Fleur Dis Lee with Pegasus wings until an update, which revealed this previous version to have been a Changeling. Outside of the game itself, a model sheet that they sketched for the game depicts unicorn Sweetie Belle with Pegasus wings. Since one of the minigames involves flying, all other ponies gain the butterfly wings given to Rarity in one episode of the show for it. A few of the many suspected factory reject and/or prototype toys are these: of unicorn Rarity, of toy-exclusive Pegasus Flitterheart, and a Glimmer Wings mashup of unicorn sisters Rarity and Sweetie Belle. She-Ra has a rainbow-winged, talking unicorn steed named Swift Wind, which despite having wings was simply referred to as a unicorn. In one episode of the show, she and Swift Wind discovered "Unicorn Island" which is an entire island populated by winged unicorns. She-Ra and the Princesses of Power reintroduces Swift Wind as a random horse who is given wings, a horn and the power of speech when Adora accidentally blasts him with a magic beam from her sword while trying to figure out how her She-Ra powers work. This is later parodied when another accidental magic beam gives a horn and rainbow wings... to a lizard. Bow: Wait, is that what happened to our horse? Princess Gwenevere and the Jewel Riders: Sunstar was the winged unicorn bonded to the lead princess. Bafflingly, suffered from All of the Other Reindeer among other unicorns, until Starla reassured her that her wings were beautiful. Segment 2 ("Chuck the Nice Pencil-Selling Guy") of episode 7 of season 1 of WordGirl had Becky and her friend Violet come up with a new mythical animal, which turned out to be a winged unicorn. They couldn't decide whether it should be called either a "Unisus" or a "Pegacorn", so they decided to call it a "Pegasussicorn" instead. In Winx Club Peg, Bloom's horse in Magical Adventure, turns into one when he eats some leaves from the new Tree of Life. On Arthur, D.W. enjoys a My Little Phony show called My Fluffy Unicorn that features winged unicorns and has a plushie of the main character. Additionally, in Arthur's Perfect Christmas, she decorated the Read family Christmas tree with winged unicorn ornaments and troll dolls. Mia and Me has Onchao, Mia's winged unicorn friend who is born a few episodes into the first season. Season 2 reveals that Onchao's missing father, Ono the Unicorn King is also a winged unicorn, explaining why Onchao has wings. Finding out what happened to him and later finding him and bringing him back to Centopia make up part of the plot of that season. Season 3 introduces a third one with the birth of Onchao's little sister, Kyara. Shimmer and Shine has the Zahramay Zoomicorns, who are winged unicorns, and can be very fast and agile, to the point the genies have a pass time called the "Zoomicorn Toss" where they try to get as many rings on the Zoomicorn's horn before time runs out. Plus, the genies care for the Zoomicorns very much, as shown when Shine is able to calm the one from their game down when she is frightened by Zeta. Sofia the First: The Mystic Isles has a unicorn island where some are winged.